Just received the new toy from the mail! 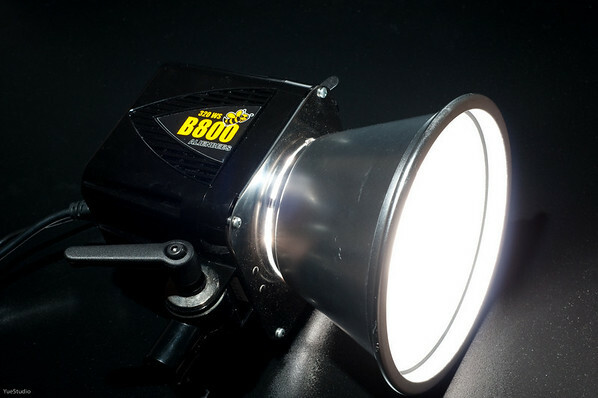 It's an Alienbees B800 studio flash. We have been using the Vivitar 273 and the Nikon SB800 in our studio and feel that we are under "power." Don't get us wrong. We love using those flashes. The Vivitar has been with me for over 20 years and it has never failed me. The Nikon SB800 is great too as it can be triggered by the on camera flash from the D300 using CLS. I wouldn't mind getting a few more SB800s but the used one cost over $350 each as Nikon stops making them. It costs more to buy them now than when it was new. I guess people just love the SB800. Here comes the Alienbees. It's cheaper than the SB800 and it runs off the wall power (save money on batteries too). Therefore, I decided to get one and try it out. So far, I am happy with my decision. Run off the wall power, no need for batteries. Fast recycle time. The flash will get slower and slower as the batteries run low but Alienbees has constant recycle time. Very easy to use. No more holding the "SEL" button for 2 seconds and get to the advance menu. Every control is right there. Built-in optical slave. Beside using the sync cable, it can be triggered by other flash. Run off the wall power unless I spend another $200 for the battery pack. No more CLS. Everything will be manual. 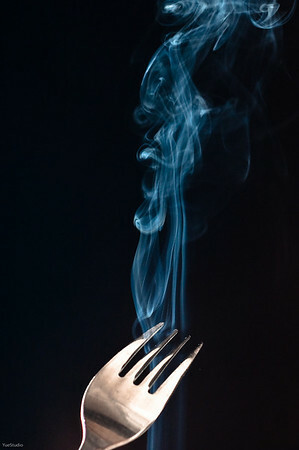 I have shot some smoke before using the SB800 and I got some good results but that took a lot of trials. Using the Alienbees to shoot the smoke was much easier. The modeling light made focusing a lot easier. I used the sync cable to trigger the Alienbees, so there was no mis-firing at all. And adjusting the power on the Alienbees is very simple and easy. I could try different settings very quickly. Here is a picture I took with the Alienbees. The strobist info on the picture with the Alienbees: Alienbees was connected to the camera via a sync cable. It's at 1/32 power. SB800 (at 1/16 power) on top pointing at the Alienbees logo and was triggered via SU-4 mode (optical trigger by the Alienbees). Simple and Straightforward. It is so cool! !